If you look online, you will likely see numerous sites and articles extolling the health benefits of red wine vinegar. The information you will most likely find will say something about how red wine vinegar can promote weight loss, help manage diabetes, lower cholesterol, combat free radicals, fight infections, or protect against cancer. These purported benefits of red wine vinegar are the same sort you can find bandied about any number of other ingredients or superfoods. As in those cases, the truth about red wine vinegar is that a small set of facts has been spun out of proportion and wildly conflated to the point of being flat-out wrong. Let’s try and pierce through the hype and look at the underlying science, shall we? To be blunt, there isn’t any. At least, there isn’t any that relates to what the health benefits of eating red wine vinegar might be. PubMed is an extensive bibliographic database of science and medical papers and research that encompasses most reputable and trusted journals. It is a reliable way to find out what published research has been done on a given topic. At the time of this writing, a PubMed search for “red wine vinegar” yields 96 results, none of which are for studies that examine the effects of consuming the stuff on the human body. The question, then, is from where do the claims of health benefits originate? Examining each idea directly will provide the answer. This claim is essentially true. Red wine vinegar is low in calories and contains no fat. If you substitute red wine vinegar for dressing, then you will usually end up reducing the caloric and fat content of the meal. There is some slight evidence suggesting that eating vinegar alongside a meal can help promote a feeling of fullness (and thus reduce overall consumption) but the study wasn’t blinded and only served bread to the participants. It also didn’t use red wine vinegar specifically, so how accurate or even applicable the results are is limited. This claim is partially supported but usually misrepresented. Red wine vinegar contains resveratrol, an antioxidant that comes with the same claims as many others. As with most foods that contain antioxidants, the alleged health benefits of red wine vinegar have included fighting or stopping cancer. Setting aside the fact that all antioxidants are not interchangeable, there are a few problems with these claims. This claim is not supported mainly because it’s not actually about red wine vinegar. A few studies have suggested that vinegar can improve glucose sensitivity in resistant individuals or may be able to reduce the glucose response from carbohydrates. The problem is that these studies have used things like strawberry or apple cider vinegar, not red wine vinegar. These substances are not readily interchangeable, so it would be extremely premature to say any findings about one type of vinegar could readily apply to another. Is it at Least Safe? The good news is that there are no real side effects from consuming red wine vinegar if it is used normally in cooking. Vinegar is, of course, highly acidic, so you should always dilute the stuff before doing anything with it. But consuming pure vinegar of any sort is not a situation most people will encounter. If you do consume too much red wine vinegar, such as taking a tablespoon or two orally at meals, then you will start running into problems. The potential consequences can include inflammation or caustic injury to the esophagus, messing up the pH of your mouth and promoting tooth decay, interfering with the body’s calcium absorption, and muscle cramps or weakness from depleted potassium levels. The main health benefit of red wine vinegar is that it has no fat and is low in calories. You can substitute red wine vinegar for dressings in your diet as a healthful way to get enhanced flavor. Other health claims about red wine vinegar are either unsupported by evidence or are conflating findings about other types of vinegar. 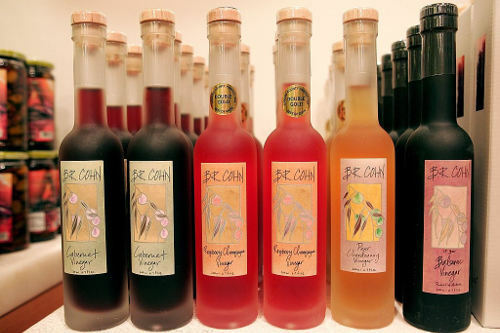 Red wine vinegar is largely safe so long as you don’t take it by the spoonful.